South Korea has developed an advanced infrared missile countermeasure that can better protect aircraft from attacks, the government said Sunday. The Defense Acquisition Programs Administration (DAPA) said it teamed up with local defense contractor Hanwha Systems to build the directional infrared countermeasure (DIRCM). The country is the sixth in the world to develop this type of defense system, which can effectively hinder a heat-seeking missile as it attempts to lock on to an airborne target like a plane or helicopter. Heat-seekers usually track a plane by detecting the heat generated by the engines or even friction caused by an object moving through the air at high speeds. 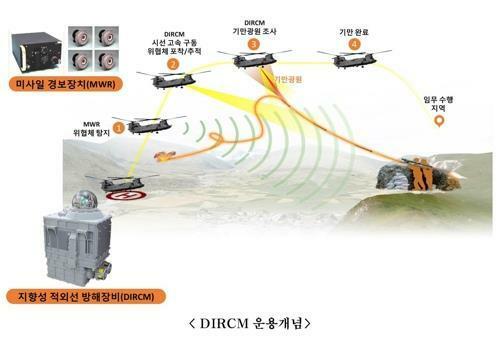 DIRCM, when incorporated into an aircraft defensive suite, gives automatic alarm if a infrared missile has been launched and shoots a high intensity quantum cascade laser at the incoming weapon's guidance sensor, causing it to loose its lock. Hanwha Systems and DAPA said that it has conducted several live tests using an actual heat-seeker in which the test aircraft successfully broke away from the pursuing missile.